The title should explain it all, but right now we are mired in PLANNNING! We took a week off to be Boozemasters for the True/False Film Festival and then a week off after that to recover. We have the final edit of our promo video for Kickstarter back and are working on a business plan. Brewing for the next promo party starts 3-24-11. Thanks for your continued interest in our beer and brewery. 2011 is going to see lots of things happen really quickly. Cheers! So it’s a new year and we’ve been crankin out beer! 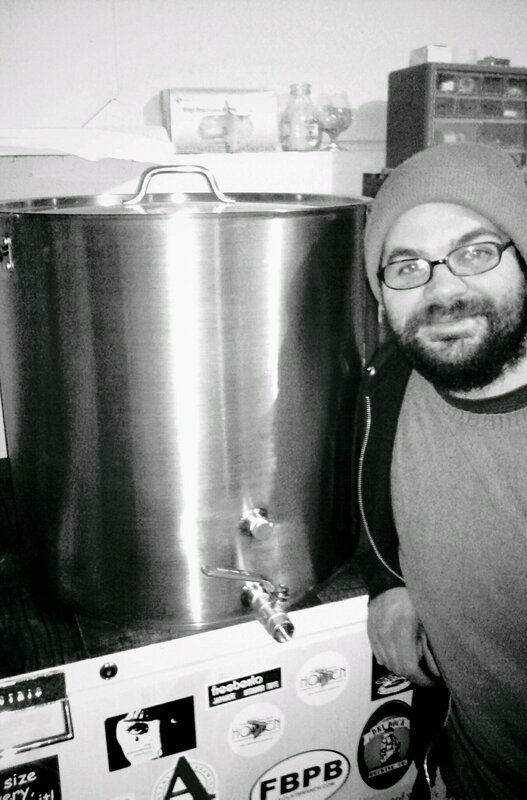 We purchased a new 26 gallon boil kettle that yields us 15 to 18 gallons per batch. In light of this we brought out the March pump and built a skateboard to mount it to that we’ve nicknamed the McFly. We’ve been anxiously awaiting our promo video from Boxcar Films. As soon as we get it we will be going live (around the beginning of February) in the hopes of achieving some funds to get our paperwork rolling. Posts will be coming at a quicker rate (at least weekly) as we’ve upgraded the system which gives us more time to mess around on the computer. If you’re in the COMO area on Feb. 5th we are having a party at the house. You know where to find us. Cheers! Today we’re going to try out our new kettle. We’ve got a batch built to yield 15 gallons of a basic American IPA. It’ll also be the first day with the pump setup (the McFly) in action. A full report and photos to follow this weekend. In the meantime, here’s a quick shot of Josh with the new vessel. Prost! We are getting back on track here after our Oktoberfest party last month. We’ve got Berliner Weisse and a Belgian Wit with Rosemary in primary right now, with plans for a Scotch Ale and the usual runs of IPAs and such. Below are more photos from this falls adventures. There will be a real post coming soon. Cheers! Hey friends- apologies for the delay on this GABF recap. I’m taking the easy way out and just doing a series of photo galleries. We had a great time working the festival, Flat Branch took home 2 medals (Silver for American Hefeweizen and Sweet Stout) and we had several great drinking sessions. We’ll be back to normal in another week or so with many brew days and the launch of our Kickstarter program. Cheers! We will be attending The Great American Beer Festival in Denver, Colorado in one week. Posts and photos will be forthcoming as we have time to put them up amidst all the beer. Keep your eyes on this here blog! Trust me, I'm a Cicerone!